In a week, no less than three motor yachts were launched by Sanlorenzo. The first one, called Scorpion, is the 6th hull of the 40 Alloy series designed by Francesco Paszkowski, a 38.5m aluminium planing yacht successfully introduced in 2007 and which was a winner at the ShowBoats and World Superyacht Awards. Scorpion is powered by twin 2,340kW MTU engines giving a top speed of 28 knots and a cruising one of 26 knots. The second launch was the one of the 4th hull of the SD122 series, a 37.44m GRP semi-displacement motor yacht. This model is also designed by by Francesco Paszkowski and also won a World Superyacht Award in 2010. Christened Santa Anna, this hull has a special interior layout with a larger saloon on the main deck and a more intimate dining room. Her engine room accommodates two 1,193kW Caterpillars giving a top speed of 17 knots and a range of 3,000 nautical miles at 12 knots. 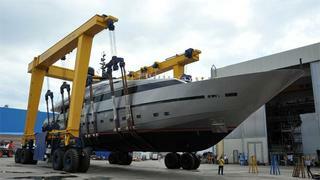 The Sanlorenzo 46 Steel Rêve d'Or has also recently hit the water. She's the third motor yacht of this flagship series introduced last year. Built in steel and aluminium, this 46m displacement yacht is designed by Viareggio Division Style, a department of Sanlorenzo. Like her predecessors, details that ensured the success of the first hull are present: the stern beach club, a large lateral tender garage, a toy garage below the foredeck and the lower deck housing technical and service areas. Twin 1,500kW Caterpillar engines give a top speed of 17 knots and a range of 4,000 nautcal miles at 12 knots. All three yachts will be delivered to their Russian owners this Summer, and during this period, seven other Sanlorenzo yachts will be launched.